This is one of those books that I've always wanted to read but have never been able to find until a random trip to the library last month. The Martian Chronicles has been cited so much in books that I've read that it seems insane that it's taken me this long to get to it, but there you go. It feels foundational, in a way, like Heinlein's The Moon Is A Harsh Mistress or Frank Herbert's Dune or any of the Chronicles of Barsoom- real old school science fiction that if you're going to really get into science fiction, you've got to pick this book up at least once and read it. So what does that mean, for those who haven't read Winesburg, Ohio? 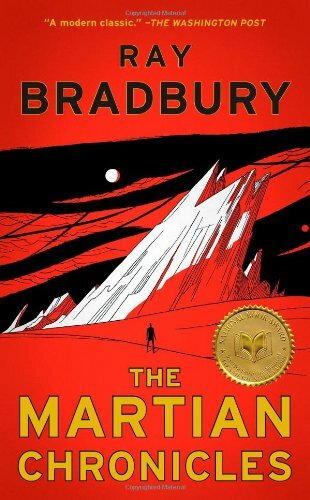 Well, it means that The Martian Chronicles doesn't follow a traditional novel structure- it's not really a collection of short stories either- though some pieces in the book are probably long enough to qualify as short fiction. Instead, it's a journey stretching from 2030 to 2057 and telling the story of the multiple expeditions sent to colonize Mars- what they found there, how it changed the settlers and what they were trying to escape and why they all left to go back home. And, in a word, this book: amazing.